Vincent van Gogh painted this picture soon after his release from the hospital, where he was recovering from the disastrous final days of Paul Gauguin’s stay with him in Arles. In a long letter to his brother Theo posted January 23, 1889, he mentions creating this painting alongside several other issues, including the need to make money through picture sales. He likely had the market in mind in painting this still life. The painter was clearly attracted to the shapes and hues of the citrus fruit arrayed in the wicker basket, and the way their varied orb shapes play against the weave of the dried sticks, the whole set off by the prickly needles of the cypress branches. Van Gogh refers in his letter to an “air of chic” in this picture, prompted perhaps by the inclusion of blue garden gloves. The painting reveals the artist’s extraordinarily original sense of color, as well as his richly expressive paint application as he struggles to evoke the nubby waxen skin of the various fruits, the spiky fur of the branches, and the limp material of the worn gloves. In the letter to Theo, the artist also describes the melancholic departure of his close friend Joseph Roulin, who was temporarily leaving his family for a new post in Marseilles, and reports a particularly touching moment during which the father bounced his newborn daughter Marcelle on his knee. Van Gogh would return to the hospital within the month following a second mental breakdown. With its reference to pruning and fruit gathering, the painting was likely a particular favorite of Rachel “Bunny” Mellon, who with her husband Paul Mellon bought the picture in 1962. Bunny Mellon was an ardent horticulturalist, landscape designer, and collector of rare garden books. Although her husband gave the painting to the National Gallery of Art in 1999, she lived with the picture hanging in her home until her own death in March 2014. Sent 2 May 1889 by the artist to his brother, Theo van Gogh, Paris [1857-1891]; gift to Emile Bernard [1868-1941]; sold by Madame Bernard on 7 January 1899 for 150 francs to (Ambroise Vollard, Paris);  sold probably 1899 to Cornelis Hoogendijk [1866-1911], Amsterdam; by inheritance to his sister, Maria Ida Adriana (Riet) van Blaaderen-Hoogendijk [1874-1942, Mrs. Gerrit Willem van Blaaderen], The Hague; her son, Tom van Blaaderen [1910-1950], Laren;  his wife, Hermanna F. van Blaaderen-van Geuns [1915-2002, later Mrs. Warren-van Geuns], Loenen aan de Vecht, in 1951. Private collection, London. (Marlborough Fine Arts, London), in 1955; probably acquired there by Sir Alexander Korda [1893-1956], London; by inheritance to his third wife, Alexandra Boycun Korda [1928-1966, later Mrs. David Metcalfe]; (Korda collection sale, Sotheby’s, London, 14 June 1962, no. 22); purchased by (Charles H. Willis), probably for Paul Mellon [1907-1999], Upperville, Virginia; bequest 1999 to NGA, with life interest to his wife, Rachel Lambert Mellon [1910-2014]. This is likely one of the van Goghs Hoogendijk bought from Vollard in May and July, 1899 (Vollard account books, July 1894- May 1900, John Rewald Papers, Box 54-2, Gallery Archives, National Gallery of Art, copy NGA curatorial files). Hoogendijk lent the painting to the Rijksmuseum from 1906 to 1911, along with other paintings from his collection. The painting was not included in the posthumous Hoogendijk sale held at Frederik Muller, Amsterdam, 21-22 May 1912. For details about Hoogendijk's collection, see Herbert Henkels, "Cézanne en Van Gogh in het Rijksmuseum voor Moderne Kunst in Amsterdam: de collectie van Cornelis Hoogendijk (1866-1911)," Bulletin van het Rijksmuseum 41, no. 3/4 (1993): 155-287. He lent the painting to a 1947 exhibition shown in London, Birmingham, and Glasgow. It was briefly in the hands of Van Wisselingh in 1948, according to a newspaper clipping, Jan Engelman, De Tijd, 3 July 1948. ‘Vincent van Gogh en de Hagenaars, Een stilleven bij Van Wisselingh.’ The article is misleading for Van Wisselingh merely acted as middleman at the time of the exhibition in the Stedelijk, after which the painting returned to its owner, Tom van Blaaderen. The year of ownership is given in the documentation on a reproduction of the painting held by The Frick Art Reference Library, New York (call number Gogh, Vincent van 316-2f). XIXth and XXth Century French Masters, Exh. cat., Marlborough Fine Art Ltd., London, 1955: 58. According to James Feron, "Korda Collection Brings $1,300,000," The New York Times (15 June 1962): 24, the painting was purchased by Willis, who attended the auction and "said he was buying the work for a client." The sale as a whole made 4.5 million florins and the still life fetched f. 800,00o (approximately $231,000) according to Dutch newspaper reports Krantenknipseldienst the following day. Mr. Mellon owned the painting by at least 1966, when it was exhibited at the NGA with works from his own and his sister's collections. Loan to display with the permanent collection, Stedelijkmuseum, Amsterdam, 1906-1911, no. 984d in 1911 catalogue. Dutch Art 1450-1900, Royal Academy of Arts, London, 1929, no. 464. Loan Exhibition, Stedelijkmuseum, Amsterdam, 1929, no. 10. Vincent Van Gogh en zijn Tijdgenoten, Stedelijkmuseum, Amsterdam, 1930, no. 60. Possibly Vincent Van Gogh, Loan Exhibition of Paintings and Drawings, City Art Gallery, Manchester, 1932, no. 27, as Fruit, Pine Branches, and Gloves. Vincent Van Gogh, 1853-1890: An Exhibition of Paintings and Drawings, Tate Gallery, London; Birmingham City Museum and Art Gallery; Glasgow Art Gallery and Museum, 1947-1948, no. 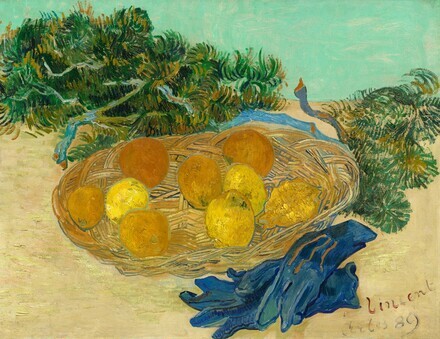 65, as Still-Life with Lemons and Blue Gloves. Vincent van Gogh, Kunsthalle Basel, 1947, no. 76. XIXth and XXth Century French Masters, Marlborough Fine Art Ltd., London, 1955, no. 79, repro. French Paintings from the Collections of Mr. and Mrs. Paul Mellon and Mrs. Mellon Bruce, National Gallery of Art, Washington, 1966, no. 134, repro. Faille, J.-B. de la. L'Oeuvre de Vincent Van Gogh, catalogue raisonné. 4 vols. Paris and Brussels, 1928: 1:no. 502; 2:repro. Rutter, Frank and Helen Comstock. "Van Gogh in 1929: Europe and America." International Studio 93 (June 1929): 38-41, repro. Knapp, Fritz. Vincent Van Gogh. Leipzig, 1930: 41, pl. 31. Faille, J.-B. de la. Vincent Van Gogh. New York and Paris, 1939: 372, no. 525, repro. Engelman, Jan. “Vincent van Gogh en de Hagenaars: Een stilleven bij Van Wisselingh”, De Tijd (3 July 1948): repro. James, Philip. Van Gogh (1853-1890). London, 1948: cover repro., 14, pl. 7. Gogh, Vincent van. The Complete Letters of Vincent van Gogh. Edited by Johanna van Gogh-Bonger. 3 vols. London, 1958: 3:126, letter 573. The Burlington Magazine 104, no. 710 (May 1962): n.p., repro. Uitert, Evert van. "Van Gogh's Concept of His Oeuvre." Simiolus 12, no. 4 (1981-1982): 241-242, fig. 14. Henkels, Herbert. "Cézanne en Van Gogh in het Rijksmuseum voor Moderne Kunst in Amsterdam: de collectie van Cornelis Hoogendijk (1866-1911)." Bulletin van het Rijksmuseum 41, no. 3-4 (1993): 227, 228 fig. 102, 292. Klusmann, Georg. Vincent van Gogh: Still Life with Peonies. Mainburg, 1996: 44. Feilchenfeldt, Walter. Vincent van Gogh: The Years in France, Complete Paintings 1886-1890. London, 2013: 131, repro., as Oranges, Lemons and Blue Gloves. Kelly, Franklin. "A Lasting Legacy: The Completion of an Unparalleled Gift." National Gallery of Art Bulletin no. 51 (Fall 2014): 14, repro.